We offer free training for everyone. Everyone is welcome to attend our training session and can become a member (free of charge) at Tensta Run. MONDAY at 12.00: Monday club, Spånga IP. For those who want to exercise! We practice Nordic walking, strength, balance and fall training. Common (free) coffee afterwards. TUESDAY at 17:00: Akalla Metro. 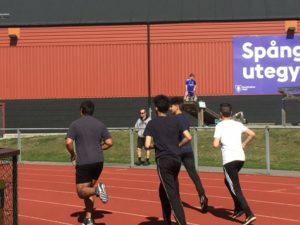 We travel to ÖIP and train with the ”Little Running Group” in Fredrikshof. THURSDAY at. 16.00-17.30: Spanga IP. Girl training in the football hall and training for everyone on the courts. FRIDAY at 11.30: Lunch run from Sergels torg. SATURDAY at 13.00-15.00: Come on with the ”Sunday bus” from Tensta center at 13.20 and finish in Akalla town at about 15 pm but you only run as far as you want. 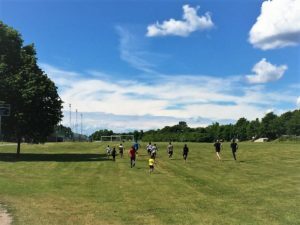 TENSTA RINKEBY GRASS RUN – first Sunday at 2 pm every month. Free to participate. Registration on site!